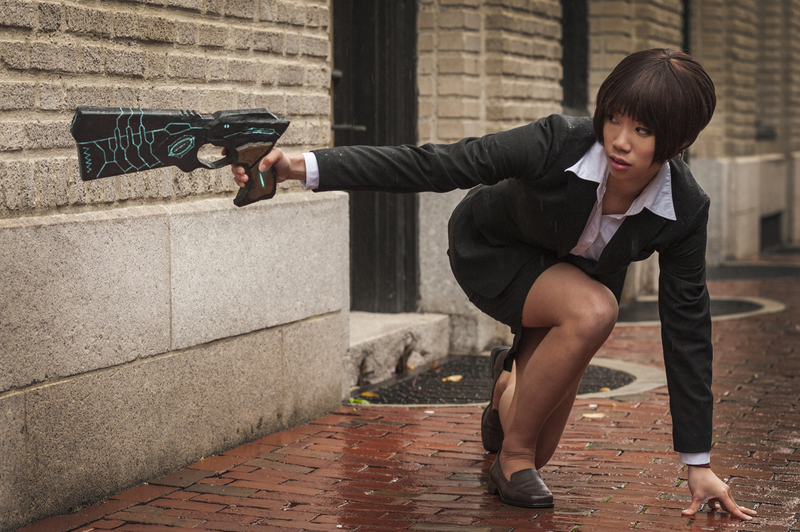 This is a long overdue post about my Akane cosplay. There’s really not much to say about it. I made a 3D model of the dominator in Google Sketch Up. Not the most sophisticated 3D modeling program, but it didn’t have too high of a learning curve to make a model when I only had 3 days to make the dominator. I raised as many faces of the parts that needed to be raised. The one downside of this application was that it couldn’t do slopes, or at least I couldn’t find an easy way to do it. Sketch Up 3D modeling. Using a image reference to get the right shape and proportions. Rotated the gun on the side so that I get the right width. After I made the 3D model, Charles helped me set it up with the CNC machine. We quickly found out that the model I made was super small and we had to scale it up. Jamison helped me split the model into halves so that we can mill out the detailed parts and then glue it together afterwards. Then after getting the insulation foam set up, and the machine calibrated, I waited for the parts to be carved out for at least 3 hours. But I was absolutely fascinated with the process so I was never bored. Charles and Jamison kept me company occasionally as I kept watch over the machine. I was literally entertained for hours as a machine carved out something I 3D modeled. As each layer was fleshed out, I kept getting more and more excited and legitimately squealed when it started carving out the details lol. Overall the experience was crazy. In 3 days I managed to build and paint the dominator in time for Halloween with help from some great friends. I honestly couldn’t have done it without them. The end result is certainly not the best and my model definitely needed some tweaking for the next time I build a dominator especially since I plan to make a Eliminator transforming one. I did rush on this build and melted part of the dominator when I used the heat gun to speed up the wood glue I was going to use to seal the foam. Instead, I sealed the foam with Microballoon filled expoy (sorry for keeping you at the shop Charles) and let it dry overnight. I’m dubbing this Dominator version Prototype. I plan the next one to be better.